In this eighth-grade humanities lesson, students make Red Lentil Stew and Spiced Cabbage Slaw, and reflect on how their own understandings of health and nutrition impact their relationship to food and food choices. This is the second in the Debate Plate lesson series, a six-lesson series that focuses on factors and considerations that influence personal food choices and the impacts of those choices. Describe food choices as complicated and multilayered. Explain some of the considerations that determine their own food choices. Feel empowered to begin articulating their own visions and practices of health in regards to food and eating. Generate a list of possible considerations for making food choices. Reflect on what factors most influence their own food choices. Recall what they have heard about health and nutrition, hear a teacher’s perspective on health and nutrition, and reflect on how this information impacts their own understandings of health and relationships to food and eating. Welcome students back to the kitchen and introduce the Debate Plate series. Explain that this is the first of five lessons they’ll have in the kitchen this spring, culminating in a pizza lesson at the end of the year. 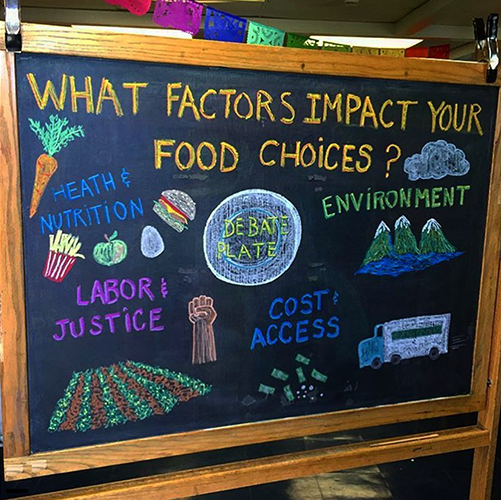 This week they’ll be embarking upon a lesson series called “Debate Plate,” which examines the factors behind what we choose to eat and the impacts of those choices. They have already started the discussion in their classrooms by reading the article about the Mandela Foods Cooperative in West Oakland. We’ll continue to talk about the themes raised in the article, and build on them over the next week. They’ll come into the kitchen four times, and spend Wednesday in the classroom doing a Debate Plate activity. All week, we’ll be thinking and talking about our relationships to food, engaging critically with the messages we hear about food and the way the food system currently works, and asking you to build self-awareness about your own food choices—the reasons behind them and their impacts. The series is called Debate Plate because each day we’ll be asking you to construct arguments and defend your opinions on all kinds of questions related to food. What do you take into consideration when deciding what to eat or not to eat? What influences your food choices? There are no right or wrong answers for any of what we’ll be talking about, and we’ll definitely raise more questions than we can answer, so we invite you to dig in without hesitation. Put ideas up on the board—leave the board up over the course of the week to add to as new ideas arise. If students are hesitant to add ideas, name a few of your considerations to get the process going. We have selected four potential considerations to focus on this week: Health & Nutrition, Environment, Justice & Labor, and Cost & Access. Today we’ll be looking at Health & Nutrition. How do you approach health and nutrition when making food choices? Student poll: Who has had some form of nutrition education before? This may have been in school, at home, or by way of information that you’ve seen, heard, or read. Think-Pair-Share: Turn to a neighbor, and in 30 seconds try to list as many things as you can that you have heard about food, nutrition, and health. You may or may not agree with these things. Walk around the room and observe and listen as students talk. There is a lot of information out there! Many of the things you’ve heard probably seem contradictory. I’m not going to add to that information. Instead, today I want to share a little of my perspective—how I’ve come to navigate thinking about my health when I make food choices. I’m not sharing because I want you to think the way I do or because I think that my way of defining health is correct. My hope is that hearing my perspective may be useful as you continue to develop your own personal understanding of health. Share a personal anecdote that illustrates an approach to health and nutrition that prioritizes long-term balance and emotional well-being as opposed to making every individual food choice “perfect." When I’m making food choices, I also don’t like to label a food “healthy” or “unhealthy.” If I do this, I inevitably feel shame or guilt when I eat food that I’ve labeled “unhealthy.” I don’t want this in my relationship to food. Nor do I believe that “healthy” food and “delicious” food are polar opposites. I think there’s a ton of food that is both healthy and delicious, and I try to spend most of my time eating in that zone. Overall, I want the food I eat to bring health to my body, and I also want to feel happy and good while I’m eating—to cultivate a healthy relationship to food. Introduce the Red Lentil Stew and Spiced Cabbage Slaw. When I was walking around the room, I heard a lot of people talking about “this food is bad for you” or “that food will make you sick,” and not as many people sharing information they’d heard about foods being good for you or health-giving. I think this is very representative of the dominant food culture in the US. We have a lot of negative framing around food that focuses on limiting how much we eat things that we think will do us harm. We chose to make two recipes from Indian cuisine today because there is a radically different approach to food in Ayurveda, a traditional medicine practice from the Indian subcontinent. Ayurvedic thought around nutrition sees foods as health-giving in different ways, and as nourishing not just our bodies, but also our minds and spirits. We aren’t going to go in-depth into that as we are no experts. Rather we wanted to prepare this food today as an introduction into that positively framed relationship to food, health, and nutrition. Students review the jobs for the day, organize themselves, and prepare the recipes. Small group check-in: What is a comfort food for you? Introduce jobs for the day in more detail. Explain how flavors in the spices we’re using (coriander, cumin, etc.) are largely fat-soluble, which is why we’ll be frying them in oil to release the flavors for both the lentil stew and the slaw. Students split up into jobs. Prepare recipes, clean up, eat. At the table, ask students to debate whether or not the government should regulate what kind of foods may be served for school lunch based on health and nutrition guidelines. If so, how should those health and nutrition guidelines be decided and who should create them? Should they be national guidelines or vary locally? Reflect together and close the class. If there is time, ask students to share thoughts from their small table group discussions. Print a set for each student to use. We deliberated on changing the name of this lesson from “Health and Nutrition” to “Relationship to Food and Food Choices” to more accurately reflect the content. Ultimately we decided to keep the name “Health and Nutrition” to highlight that having a healthy relationship to food is part of health and nutrition. The principal goal of this lesson and series is to encourage students to engage in reflective, critical thought about their food considerations. We are not trying to change their considerations in any way except to encourage them to do mental work, which may result in their own changes. We are actively seeking to avoid shaming any existing considerations or choices. In building this lesson we were looking to build a counter-narrative to a common narrative in nutrition education: that there are “bad foods” that will degrade and destroy your health and that they need to be avoided entirely. We first wanted to build a lesson with positive framing that acknowledges the tremendous joy that many students derive from eating as a valid input to making food choices. We also wanted to alleviate guilt and shame and share a vision of a healthy relationship to food as opposed to a narrow focus on healthy foods. A major part of the desire to do this rose from seeing our students shamed in other nutrition lessons that vilified foods that they frequently consume. This happened most often to students of color and students from low-income households. We saw this as counterproductive to building a relationship with the students, which we see as essential to being able to teach them and effect change in their lives. At the start of the lesson we acknowledge that these recipes are less forgiving than many things that we cook and that they must follow instructions carefully because the techniques matter. We frame this as advancement and trust in their cooking ability. Measuring and combining the lentils and water before class starts allows the lentils to soak for 20 minutes or so, which speeds up the cook time. We found that working closely with students on toasting and blooming spices was important to get the most delicious coleslaw and stew. If the cumin and mustard don’t get toasted enough, the slaw has very little flavor. We found that putting a copy of the recipe next to the spices with the spices highlighted made it significantly easier for students to navigate that part of the recipe. The coleslaw recipe uses the word “shredded” to describe how to prepare the carrots and cabbage. We were surprised to see many students confused about what to do with that instruction. We guided them to using knives, peelers, and graters based on how they wanted the texture to be for their coleslaw. Asafoetida is a good addition to the lentil stew if you have it or can get it easily. That said, it is not essential. The stew is delicious without it as well. We asked students to try the sliced onion before and after it had sat with the salt and lime so that they could observe the difference in flavor and texture. If time allowed we would describe how some flavors are water-soluble while others are fat-soluble and that cooking in fat and then in something aqueous can extract the most flavor. If time allowed, we used the food consideration cards after finishing cleanup. Ask students to make a map or chart of their food considerations from most important and most frequently thought about to least important or rarely thought about. Do they have any cards or considerations that they would like to be in a different place? Would an aspirational map look different? Ask students if they think that their considerations will change over time. Anything specific? Ask students if they were surprised by anything on their map or if the process helped them learn about their considerations. We asked students if we should make and include a body image card in the deck to generate conversation around how they think about food and their physical appearance. This typically yielded a rich conversation with most students agreeing that we should include that consideration. Our check-in question for this lesson was, “What is your comfort food?” This is to reiterate that happiness, pleasure, and emotional well-being are part of health and wellness. Students were often skeptical of the concept, the recipe, and the food itself while they were cooking. We responded by asking them to have faith in us as teachers, cooks, and eaters and to trust in that we always make delicious foods. Almost all the students really enjoyed the meal, and many were vocal about being surprised by how much they liked it. The coleslaw and lentil stew make a great pair of dishes as they have very different dominant flavors. We encourage the students to try them together in the same bite and to try them in alternating bites and discuss how they like it better and if they think they support each other. At the table we often talked about school lunch and the nutrition guidelines for school lunches. We asked students if they thought they were a good idea or not and what effects they have. Engage in structured groups to complete tasks and practice teamwork. Make positive contributions to small group discussions. Communicate relevant questions to classmates; build language and listening skills by practicing self-control, self-awareness, and noticing our impact on others.